The Partagas Serie Connaisseur No.1 is a classic Partagas, a strong Delicado, 7.6” (192mm) long, of 38 ring gauge, and comes in a box of 25 cigars. One of the classic true Partagas: strength, spiciness and perfect burning. The finish is heavy and very powerful. This is a royal selection cigar that demonstrates to us that new generation cigars can be extremely high quality. 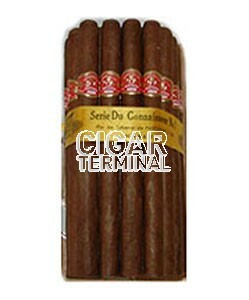 Balanced taste and aroma as expected from this brand..
SLB box of 25, same cigar size as Rey del Mundo Grandes de Espana.